We first met her in 2010, while she worked at the Singapore Management University. Besides her academic work, she is passionate about film making and impacts the poverty issue in Vietnam thorough charity activities. 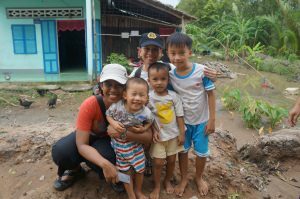 When he asked the question, the small child’s eyes were laughing with the typical joy of the age, in a faraway school in the South Vietnamese Mekong Delta which she was visiting. Grabbing in her bag, she took out a souvenir pen bought during one of her educational conferences in London. The joy she witnessed seeing the child so happy just because he had a pen to do the homework with and the sense of satisfaction she had that she was able to support something so meaningful for somebody with such a small gesture from her side, convinced Jeanine to bring next year all her 200 collected souvenir pens and distribute them in the school. Jeanine considers that she has been blessed in life, in order to have the things that she has: access to education, good quality life, security. This made her think about what she can do more. “I talked with friends and they said: you should look for sponsorship, set up something formally and get support from local NGOs and institutions.” After hearing this advice in 2013, Jeanine realized that the work which she has been doing since 1993 finally took off and has much more potential and can have a bigger impact than she realized until then. 5. 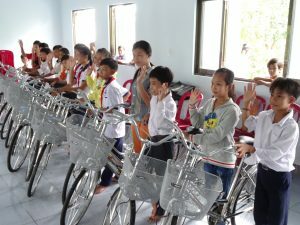 Mobility: buy bicycles for school children living in the villages who have very long commutes to school, reducing their time on the road from 2 hours walking to about half an hour bicycling. Not always few are the challenges in the implementation of such a project: fund-raising, bureaucracy, trust in the local authorities and even life threats. In some of her trips Jeanine had even police escorts, because she might invite criminals. She believes in helping people directly, people give her money in trust because they trust her do something good with it. She and her team work with local councils to make sure that they find families truly in need. Nevertheless, it requires a lot of trust in the local authorities and good communication skills to really get to the ones truly in need and give a helping hand. People tend to shy away from charity because they feel that they won’t help unless they can help in a big way – that means, giving a lot of money. But every dollar counts, it makes a difference. A bicycle for a kid in Vietnam costs about 70 Euro. 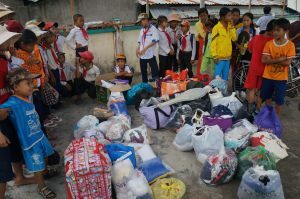 If 70 people give 1 Euro, another 1 kid can make it to school in Vietnam.